Idler Shafts must be ordered seperately. Click here for shaft selection. 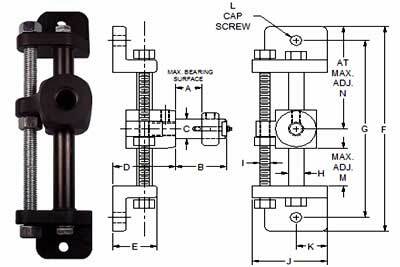 The Single Adjusting Tensioner can be mounted on any point of a shaft or stud. This tensioner permits controlled tensioning at any point of the 360° arc. The split at the base of the arm allows for fast adjustment and tight clamping on the shaft. The SAT series tensioner should be used when a frame member is not present and a bolt-on tensioner is not an option. The Double Adjustable Base Mount Drive Tensioner has a 360° rotating arm that permits controlled tensioning at any point of the arc. The adjusting slot gives the operator easy adjustment to keep proper tension on the belt or chain drive increasing the life of the drive. This tensioner has serrated teeth to prevent slippage. The AFT Series Tensioner has a flanged base that can be mounted in a tight area where space is limited. The rotating arm gives the operator 360° controlled tensioning and can be easily adjusted to the proper tension increasing the life of the drive. The AFT Series Tensioners have serrated teeth to prevent slippage. The AAT Series Tensioner has an angled base that can be mounted on the top of a frame member. The angled base provides parallel tensioning with the drive. This tensioner has serrated teeth to prevent slippage. The FFT Series Tensioner has a fixed flanged base that can be mounted in a tight area where space is very limited. This is the ideal tensioner when the center distance between shafts is excessive and additional tensioning is required. Typically used with a combination of fixed and adjustable tensioners. The FAT Series Tensioner can be mounted on top of any flat surface and will provide horizontal tensioning. Can be used with other FAT series tensioners as well as other tensioners to achieve proper tensioning. The SLT Tensioner Series uses a compression spring for automatic tensioning, the spring will compress 1 inch for every 28 pounds of force with a max. travel of 3 inches. This tensioner will provide constant tension that will protect the drive from damage caused by shock and pulsation. The head rotates 360° and the base has additional vertical adjusting slots. The AST Series Tensioner uses screw adjustment for positive precise tensioning. Can be easily mounted to any flat surface and a favorite for operators that need to make very fine adjustments. The ST Series Tensioner provides vertical tensioning by the use of a sliding shaft through a mounted base. The split in the base allows for fast adjustment and tight clamping on the shaft. The tensioner head rotates 360° and is a great option for long shaft centers. The RDT Tensioner has the ability for continued tension on reversible drives by using a floating arm that will automatically relocate when the direction of the drive is reversed. 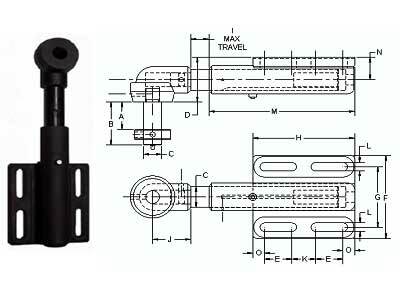 The VMT Tensioner has a 3 1/2" travel through the use of the vertical slot. The head is drilled and tapped to accept the SO5-F & SO6-F shafts. 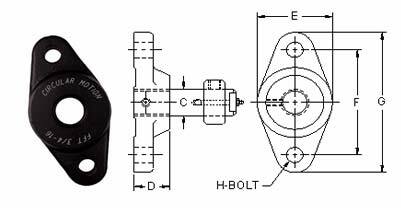 The HMT Tensioner has a 3 1/2" travel and is mounted 90° to the length of the part. Both ends are tapped so the shaft can be threaded on either side of the tensioner, the hole is tapped to accept the SO5-F and SO6-F shafts. The HDBB1 Tensioner is designed for heavy duty drives and has a travel up to 6" through the use of the adjusting slots. The head is drilled to accept a 2" shaft. The shaft is mounted straight out from the face and is anchored by set screws. The HDBB2 Tensioner is designed for heavy duty drives and has a travel up to 6" through the use of the adjusting slots. The head is drilled to accept a 2" shaft. The shaft is mounted to the side at 90° and is anchored by set screws. in between the adjusting slots. The shaft is anchored by set screws. shaft is anchored by set screws.